2014 was a huge year in online video. In fact, video was the driving factor in a lot of decisions that consumers and brands made online. As video continued to rule the conversation online this year, here are a few of it’s breakout moments. If you’ve tried posting videos online in the past but haven’t seen the results you were hoping for, it might be because a) your video content or production was off the mark or b) your online video distribution strategy wasn’t developed well enough. An online video distribution strategy is critical to the success of your video towards your end goals. It’s not a 'film it and they will watch' scenario, you must film it and then tell everyone to watch! Here are seven components to include in your online video distribution strategy. Optimize the video for search. Why do we talk about SEO so much? Because it provides the opportunity for your video to be placed right in front of your target audience when they search for something like it. SEO is part of the foundation of a successful video distribution strategy. Wherever your video is posted, it should be optimized for search. The title, tag, and description you use for your video are all very important to search engines who rely on that information to tell them what your video is about. Optimize the video for sharing. In addition to being optimized for search, you should also optimize your video for sharing across the internet. Things like share buttons, shortened URL’s, and a call to action that encourages viewers to share with their friends all contribute to helping your video go a step further past distribution and into becoming viral. What is a viral video? Any video that’s shared and becomes popular among a group of people. You may not get a million views in one day, but you can consider viewers in your target audience sharing your video with other people like them a viral success. There’s no other way around it. If you want your video to have the widest distribution and the best chance to become viral, you must put it on YouTube. Resistance is futile and will only result in a huge missed opportunity. Even the biggest companies who can afford the more expensive video hosting solutions turn to YouTube for sharing their videos online. In fact, 69% of Fortune 500 companies have an active YouTube account. YouTube is the place on the internet for viewing and posting online video, end of story. So, get started by creating a YouTube account using our step by step guide, then add your video to your YouTube account by following this checklist, and you will give your online video distribution strategy a giant push forward. Add the video to your website. YouTube is great, but you also want your videos to be displayed right on your website. Follow these tips for adding your video to your website, and then run tests to make sure the video shows up properly in search engines and can be viewed on a mobile device. Send the video to your email subscribers. Your email subscription list represents your most invested leads and customers, so you should send the video to them first to start off on the right foot and build momentum. Add the video to your email by adding a video thumbnail to the email that links directly to the video. If you’re linking to the video on your website, make sure your website is mobile friendly! If it is not, you’re better off linking to the video on YouTube. Post the video to social media - more than once. If you have thought ahead and developed an engaged social media community, then you should share the video with them according to best practices for each particular social media platform that you are active on. For Facebook, use Facebook insights to see what day and time your fans are on Facebook the most, and post at that time. Post the video again at another peak time a day or two later. Also consider boosting the post through Facebook ads for even more reach. On Twitter, you’ll want to post the video multiple times because of how quickly information moves. Post at different times of the day, and use different intro text each time. Also, YouTube videos will play inside of Twitter, so use your YouTube link when posting there. Pinterest is another great platform to post to if you think your target audience spends time there. YouTube video thumbnails can be pinned and played inside of Pinterest as well. Instagram can be used to promote your video even if you can’t post the whole thing. If it’s longer than the 15 second limit, then post the first 15 seconds as a teaser and encourage viewers to go to your website or YouTube channel to watch the rest. Reach out to your partners or industry bloggers. One of the great features that YouTube has is the ability to embed your video on any web page. This can give your video more reach if it is featured on other websites that your target audience visits. Develop key relationships with influential bloggers ahead of time and approach them with new video content that would be valuable to their visitors. Maybe even consider asking them what kind of video content they would be most likely to share with their audience to get some new ideas. Once you have distributed your video, don't forget to track and measure the results. Using tools like Google Analytics, YouTube Analytics and Facebook Insights will provide valuable information that will help you optimize your online video distribution strategy the next time around. Catch up on what you missed in Part One and Part Two. 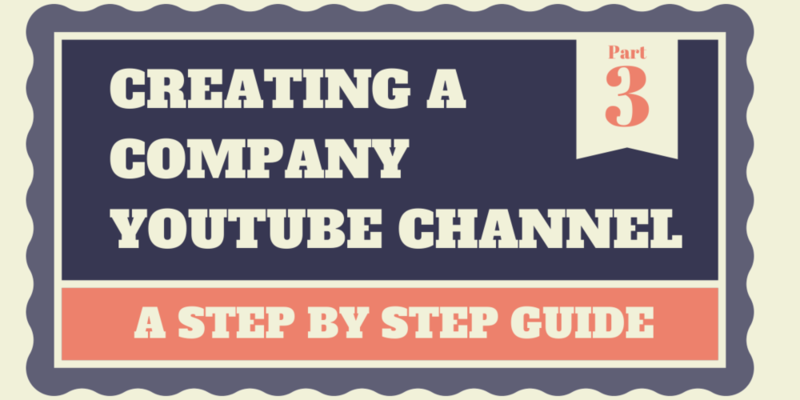 In Part Three of our Guide to Creating a Company YouTube Channel, we will continue to perfect the visitor's view of the channel to increase video views and subscribers. We will pick up where we left off last time in the About section and teach you how to take advantage of an area called Featured Channels. We will also share tips for creating a Channel Trailer, and creating Sections and Playlists to fill your channel with content - even if you only have a few videos. The default title of the section below the links and description on the About page is Featured Channels, but the title can be customized to suit your needs and how your company will use this section. We renamed ours "Orlando, Florida on YouTube" to feature YouTube accounts relevant to the community we serve. Basically, this section allows you to feature YouTube channels you choose by displaying them with their channel icon, name and number of subscribers. All you have to do to edit this section is to click on the pencil icon in the top right corner, then start adding channels. Feature the YouTube channels of past or present clients. Feature the YouTube channels of businesses you partner with. Feature the YouTube channels of other departments within your company. Feature local YouTube channels to establish your connection with the community you do business in. Feature the YouTube channels of nonprofits or causes your company supports. Feature the YouTube channels of organizations you are a part of, such as your local chamber of commerce. A Channel Trailer is a video produced for the purpose of explaining to the viewer what your business is and what they can expect from your YouTube channel. Don't make the viewer draw their own conclusions about what your business does, tell them! Trailer videos are especially important because of the limited space for text on YouTube Channels. Having a trailer video allows your company to tell it's story with emotion and vibrance. Since this video will be the first video people see when they come to your YouTube channel, it should be a professionally produced video that is intriguing and indicative of the style of videos the viewer can expect. Keep it short. 30 - 90 seconds is ideal, or at least keep it under 5 minutes. Don't make it a sales pitch. You'll turn off viewers immediately. Encourage a call to action. Remember those decisions you made at the beginning of last week's guide? Refer to them to decide what your call to action is going to be. Use the InVideo programming option to guide viewers to the next video you want them to watch. Get inspiration from Hollywood. They use trailers for movies to get people excited about the coming attraction. Your channel trailer should achieve the same effect. It's very easy to add a Channel Trailer. Simply upload a video like you normally would. Then, go to your channel page and roll your mouse over the top right corner of the channel trailer section until the pencil icon appears. Click to change the trailer, then choose from the videos you've uploaded. Note: Your Channel Trailer is only displayed to visitors who are not subscribed to your YouTube Channel. Subscribers do not see the Channel Trailer. A playlist in YouTube is a collection of videos, either your own or those of another YouTube channel. These playlists can be displayed as collections of videos on the main page of your YouTube channel. When used strategically, they can guide visitors through your content to discover older videos or videos on certain topics. Creating a playlist is very easy. Just go to the video that you want to add to a playlist, then click on the "Add To" tab below the video. From here you can create a new playlist by entering the name and clicking "Create Playlist", or you can add the video to an existing playlist. Since playlists can include any YouTube video and doesn't just have to be a video you've uploaded, using playlists is a great way to make it look like there is a lot more content on your YouTube page than there actually is. For example, if you just started using YouTube but don't want to look like a newbie, creating playlists of other people's videos that relate to your business would be a great idea. Playlists are also great for displaying videos that are about your business, but that you haven't actually uploaded yourself. For example, if you are a franchise and your corporate entity is on YouTube, you can curate a playlist of their videos along with the ones that your franchise has created. This will help you to still have branded content on your YouTube page and also will help your YouTube channel to look more robust and full of video content. Once you have created a few strategic playlists, now you can create sections to display them on your YouTube Channel. Below the Channel Trailer are sections where you can categorize and prioritize your videos for viewing. On the right side you will see a pencil icon when you scroll your mouse over it. Clicking this icon allows you to edit a section. Scrolling to the bottom, you will see a button that allows you to "Add A Section." For most of these options you will be able to create a custom title for that section, for example "Project Portfolio" or "Meet Our Staff." Once you've created a title, choose which way you would like the videos to display, either horizontally in rows or vertically in columns, then click done. Now that your YouTube Channel is optimized to look great to your visitors, in part four of our Guide to Creating a Company YouTube Channel we will teach you how to adjust the settings so that your YouTube channel gets more traffic, and also sends more traffic to your website. Anyone can add a video to YouTube (clearly, since 100 hours of video are uploaded to YouTube every minute!). But just because you add it, doesn't mean it will get seen. Especially with marketing videos, where views are one measurement of the return on your investment, you need to know how to properly add marketing videos to YouTube so that they are viewed as many times as possible - and by the right people. Here is a step by step guide to adding marketing videos to YouTube so they will be discovered by your target audience. When deciding on a title for your marketing video, first determine what keyword phrase you want to be found in search for. Your keyword phrase should be a search term that your target audience might put into Google or YouTube to find a video like the one you have produced. Your chosen keyword phrase should be the first part of your title, then you can add your brand name or a short phrase to entice people to watch the video at the end of the title. Take advantage of the description section and spend some time here. The YouTube video description is very valuable property, and writing a proper description can lead to your video showing up more in search results, which will result in more views and possibly more referrals to your website. Start first by including the full URL of your website (example: http://www.talkingheadstudio.com). This way, it's right below your video and the first thing people see in the description. Then, if the video intrigues them enough to want to learn more about your product or company, they can easily click through to the website. Next, include a detailed description of the video. What will people see, learn, or experience by watching the video? Also provide any necessary context, back story, or fun facts that they won't find in the video. Be sure to include your target keyword phrase a couple times throughout your description. At the end, add a call to action. Do you want them to visit your website for more information? Include the link to your website again. Do you want them to follow you on social media? Include your major social media account links. Keep in mind that only the first two sentences or so will show on the description below your video. The user will have to click on SHOW MORE to see the rest. So be smart and strategic with limited space you have at the top. Include your keyword phrase in the tags section, as well as 5-10 more keywords. YouTube will give you some suggestions based on your description which you can use. These are tags that have been used previously by other videos or are commonly searched. Use your best keywords first, then the longer, more descriptive keyword phrases after that. You will have a few options to choose from for thumbnails. The thumbnail is a still image from the video that will be used as the image that shows up in YouTube and Google search results, as well as at the end of videos in the suggested video section. Choose a thumbnail that best represents the content of the video, such as a title screen or major subject. Obviously you will want the video to be public if you're trying to generate views. If you unlist it, it will not show up in search engines but you will be able to send someone the link directly to the video. By choosing private, only specific people that you choose are authorized to watch the video. Add some teaser or intro text here to let your subscribers know that you have uploaded a new video for them to watch. You can also share that notice to Facebook and Twitter, unless you already have a strategy for sharing on those networks. Choosing the proper category is another way you can improve the visibility of your video to the right audience. There are not very many categories to choose from, so choose wisely. Comedy and Animals are the most popular categories, but they are also the most saturated. Comments are a great way for people to engage with your video content, so we recommend allowing them. You can choose to moderate them so that they do not show up until you approve them, however it will mean more work for you. The Standard YouTube License is the default option and covers the video as your property, but if you would like people to be able to use your video for free while crediting you, you can switch it to the Creative Commons License. If your content has never been aired on US television then you don't need to worry about this option. If it has, choose the option that pertains to your video. Note: Captioning of your video is done in the editing options of your video, not in these advanced settings. For more about captioning your YouTube video, read our blog post How To Get More YouTube Views With Captioning. Allowing embedding means that people can embed the video on their websites or social media sites to share with their followers. This is a good thing for you if you are trying to get people to view your video, so leave this option checked. Also you'll want to notify your YouTube subscribers when you add a video, so they can check it out. Your subscribers are your most loyal fans and the most likely people to watch your video. If it's appropriate to do so, include the location where your video was shot. OR, include the location of your business. This information helps your video to be discovered locally. You can add the recording date if you feel it adds context to the video. YouTube and Google allow users to search by date, so adding a date would be especially important if the video is about a current event. Otherwise, you can add the date the video was uploaded or leave it blank. Unless you shot your video in 3D (and we're not sure why you would do that), you don't need to worry about this option. If you don't want people to see statistics such as the number of views, subscriptions, or shares the video has generated, you can opt to not share these statistics with users. Generally this information is harmless, but you may not want to let your competition in on it. YouTube provides even more editing and optimization options to further move viewers through your sales or engagement funnels. We'll give you a step by step guide to those options in a later blog post, so stay tuned!